FSX - A Flawed Gem? HelloI dont have FSX as i am very happy with my FS9 setup and my favorite addons havent been ported over yet.I also use FSforce when flying aircraft that use a stick, it is one of the best addons that i have bought, Have you got it to work in FSX yet?I agree with your list of favorite addons but would add Radar contact 4.2 and TrackIr to the list, cant fly without them now. No argument here either.I was dissapointed at first myself, and had originally applied many of the tweaks to get things running initially, but since upgrading to 2GB RAM have virtually removed them all (in particular texture downgrades). Mine is just a few minor CFG tweaks now and I get between 10 and 35FPS, with close to max scenery density and weather effects, cars on the roads, lots of AI planes, and even the cars on the roads, great water effects, complete with cruise ships and stuff - it's looking great now. Sure, it's not FS9 frame rates, but it is smooth enough I don't even notice, and try to avoid even looking at FPS now. Like many say, FSX is FAR more smooth and responsive at low FPS than FS9 was.The improved feeling of flight: I heartily agree, the weather and turbulance effects, the flight model upgrades and the improved VC's and views really make it for me. For me, no-matter how fancy it looks, it's the 'feel' that is important for me.Is it perfect? No - I still have a whole lot of things I really wanted to see in this latest version, but it's a good step forward, and I know all the third-party developers will fix many of my other whim's as time goes on I'm sure, just like they did in FS9! >Honestly I'm not using any tweaks with FSX, and I'm loving>it. However, I am not using any autogen.>>At first I thought of it as a loss, but once you get used to>flying around in FSX without autogen you realise how amazing>the sim really is. It still looks incredible, especially the>sky, clouds, water and ground, and runs fluidly on my system>(average 30-40 fps).>>My suggestion would be to try it without autogen for a while,>I think you'll find it actually leaps ahead of FS9, especially>the ehnanced "feel" of flight you get from the sim.>>JamesI agree strongly here - FSX textures are so crisp I think autogen detracts from the eye candy. 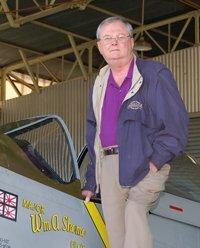 I get amazingly smooth performance and the sense of flight is far better.Ray Keattch. Yes I agree but I would call it fool's gold rather than a flawed gem. I also agree, the new FSX textures are very realistic, and its like flying over photoscenery in many places. I keep autogen off now.It is important to have the terrain texture set to 1m to give a much crisper view of the scenery below. Hahaha, Ismet you should see the desert scenery surround Exeter Airport..............Global warming at its extreme! !